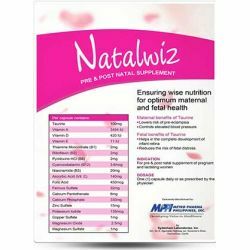 by Metro Pharma Phils, Inc.
As food supplement for pregnant and lactating women. Recommended dosage: Take 1 capsule a day, or as prescribed by the doctor. Do not take more than the recommended dosage. Pregnant and lactating women should consult the doctor first before taking any supplement or medication. This product should not be given to patients with known allergy to any of its ingredients.